The head of the Ground Zero mosque project has been replaced by a new Muslim cleric, one who organizers hope will be less controversial. The head of the Ground Zero mosque project has been replaced by a new cleric, one who organizers hope will be less controversial. Imam Abdallah Adhami, the new head of the “Park51” project as the Islamic Center project is being called, has long been active in New York's Muslim community, according to a report published Saturday in the New York Post. Organizers told reporters the move came as part of a major leadership shakeup that clearly was intended to change the project's image and possibly reduce grassroots opposition to its location. Imam Feisal Abdul Rauf, original head of the planned 13-story Islamic community center, will step down from his role and is being shipped out on a national speaking tour to promote interfaith relations. However, Rauf remains on the board of directors for the mosque, organizers emphasized. And Adhami may yet turn out to be just as controversial as his predecessor: he was a character witness in the trial of convicted 1993 World Trade Center bombing terrorist Sheikh Omar Abdel Rahman. In addition, the imam, who has a degree in architecture from the Pratt Institute in Brooklyn, designed Masjid al Taqwa, a Brooklyn mosque for Imam Siraj Wahhaj, considered by prosecutors to be an unindicted co-conspirator in the Rahman trial. A website created by Adhami, called Sakeenah.org, also highlights the terrorist-linked imam. Sharif El-Gamal, president and chief developer of the Park51 project, said the $100 million facility is still on track. 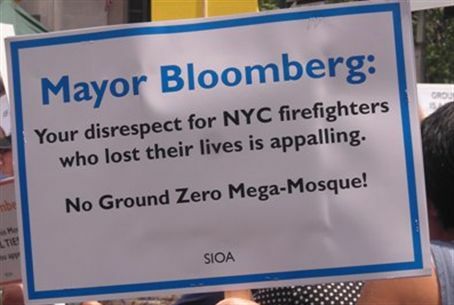 The mosque and Islamic community center is slated to be built just two blocks from the site of the September 11, 2001 terror attack that killed 2,606 people and destroyed the Twin Towers of the World Trade Center.